The AP 7532 802.11ac WLAN access point adds bandwidth and performance to your network — a must for supporting high-density traffic from laptops, tablets, smartphones and other devices – while delivering advanced security options. Configure the AP 7532 to act as an in-line sensor for client location awareness and as a tool for security threat analysis, or dedicate a single unit to a security role full-time for greater power and performance. This is the type of flexibility network managers will appreciate when designing your secure network. 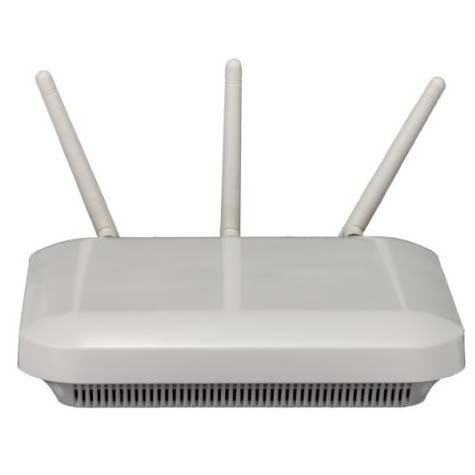 The AP 7532 features dual radio 802.11n and 802.11ac as well as three spatial streams combined with 256 QAM modulation support on both 2.4 GHz and 5 GHz radios. The AP 7532 is able to serve all devices and applications, such as voice and HD video, while delivering increased speed. All of this speed is on the 5GHz band where Bluetooth-enabled devices or even microwave ovens can’t interfere, providing a high-speed, multiple-user, and multiple-device experience for your employees or guests. The AP 7532 with a small form factor is designed to blend in unobtrusively when installed on a ceiling. The unit’s external antenna variant can be outfitted with High Density Panel antennas designed to accommodate high ceilings or tight locations. This kind of versatility delivers flexibility when you need it most. The dual radio AP 7532 provides the simplest path to next generation wireless LAN. The 802.11ac radio readies you to support new 5 GHz mobile devices, while the 802.11n radio ensures support for all existing mobile devices — including 2.4 GHz clients. The radios work together to allow you to migrate to 802.11ac at your own pace — and without the high cost of "rip and replace."